It looks like the rewards for Destiny’s recently revealed Refer-A-Friend program may have been revealed, including all of the usual goodies we’ve come to expect from such a promotion like shaders, emotes, emblems and more. Twitter user TheCryptarch recently started posting a bunch of pictures of some mysterious in-game items for Destiny. They’ve been pulled together in one convenient post on reddit and, according to the most recent speculation, the items will serve as rewards for the upcoming Refer-A-Friend program within the game. Announced last week, no details for the Refer-A-Friend program were revealed outside of the fact that they would encourage players to get their online buds into the game and help introduce them to Destiny’s various systems in some way. We don’t officially know when the program will kick off, what it will entail or what those rewards might actually be. Unofficially, however, it looks like players who utilize the program will activate a quest line that must be completed with their Kinderguardian pal. Doing so looks like it will unlock a collection of goods for both players. 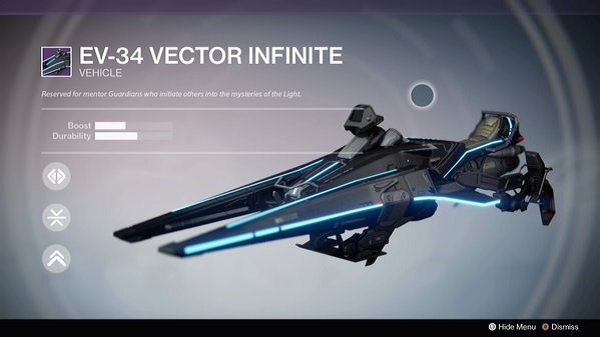 Those items include the High Five emote, a Duo Dance emote, the EV-34 Vector Infinite Sparrow, an Infinite Link Shader and an as yet unnamed emblem. 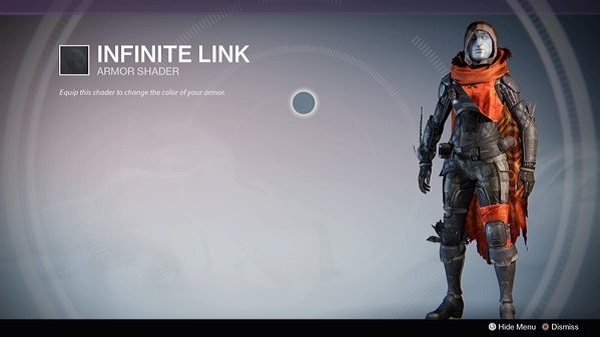 The shader pattern can be seen above, with that sweet-looking Sparrow on display below. Seriously, that thing looks like a Light Cycle from Tron, which is 100 percent rad in my book. This seems like a pretty great way to get even more people playing Destiny and even encourages the cooperative adventuring that beats at the heart of the game. One of the biggest hurdles keeping me from joining certain coop-focused games is not knowing if any of my friends play it and, even then, if they’d be willing to help a beginner jump in and learn the ropes. Destiny’s Refer-A-Friend program basically gets rid of that barrier, offering incentives to old-school players to encourage their pals to jump in and, more importantly, help introduce them to the game. The structure of Destiny is also great for these kinds of situations. While your beginner pal probably won’t want to join you in high level events, many of the game’s rewards come from tackling challenges that can completed in just about any situation. If you’re looking to kill a bunch of Hive and score some headshots, you might as well do it while chaperoning a friend through missions they’re having trouble with.